Umami is described as a pleasant savory taste imparted by glutamate, a type of amino acid which occurs naturally in many foods including meat, fish, vegetables, and dairy products. As the taste of umami itself is subtle and blends well with other tastes to expand and round out flavors, most people don't recognize umami when they encounter it, but it plays an important role in making food taste delicious. Umami is considered the fifth taste, in addition to sweet, sour, salty, and bitter. In Umami, ten of today's most renowned chefs explain how they discovered this fifth taste and the ways in which it has had an impact on their cooking. Two of the chefs are Japanese (Nobu and Murata), but the others come from around the world: the U.S. (Anthony and Kinch), the U.K. (Blumenthal and Cursan,), France (Bourdas and Nagae), and Peru (Martinez and Schiaffiano). Despite their diverse backgrounds and locations, however, they all have in common an understanding and appreciation of umami, and the unique ways in which they're able to use it to maximize the exquisite flavors of their culinary creations. For each of the eight main contributors, there's a two-page color spread featuring a personal essay about umami, and photos of the chef and his restaurant. Then the chef presents four recipes that showcase the fabulous umami-rich dishes that have earned his establishment its Michelin star(s). The recipes incorporate fresh, local ingredients and use no butter or oil, so they are healthy as well as sublimely delicious. An additional section of the book showcases pastry, as two of today's leading pastry chefs weigh in on how umami plays a role in their baking. Recipes for both savory and sweet treats are included. 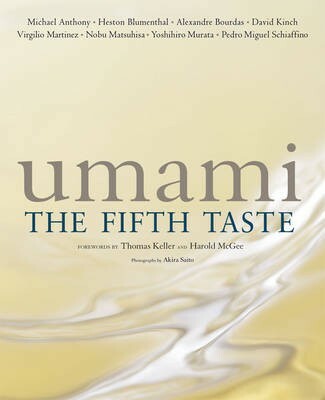 The book also includes information about the history and science of umami, written by two leading experts on the subject, John Prescott, Ph.D. of Taste Matters Research and Consulting, and Ole Mouritsen, Ph.D., of the University of Southern Denmark and author of Seaweeds and Sushi: Food for the Eye, the Body, and the Soul. The gorgeous photos throughout are by Akira Saito, the photographer for Edomae Sushi, published by Kodansha in 2010.